Okay, this show on FX freakin' rocks. It has to be the single most funniest "adult" comedy sitcom I have seen in a long, long time. Honestly, I never even knew the show existed before Hulu introduced me. Hulu is like the best video streaming service on the net and the best part... totally freakin' free! Has lots and lots of other shows, as well, but not only that, movies too! Even older shows are available on the service. Anyways, back to the topic at hand.. It's Always Sunny in Philadelphia is a remarkable, very funny show and anyone who even slightly has a sense of humor must watch it, unless of course, they already are. Be warned though, there is some pretty offensive topics they talk about and bring up. If I didn't know any better, a lot of the stuff they do is ad-lib, but who knows. Oh yeah... the show is about five people who all run a bar, Paddy's and they basically joke about every single thing known to man. They all come up with different schemes, crazy, crazy ideas and what not. 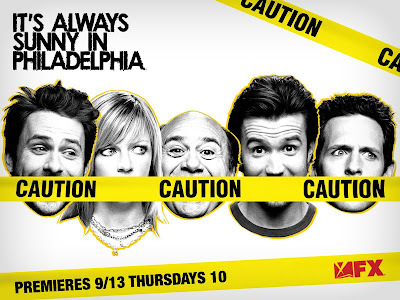 Great show, great set of actors and Danny DeVito(as Frank Reynolds) is even in there. You can't go wrong with that guy.